680 recipes from 65 chefs. 338 pages. 4 color cover. 6" x 9". Lay flat binding. 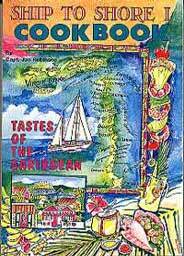 65 Caribbean charter yacht chefs reveal a fabulous collection of closely guarded and treasured recipes that have enticed and tantalized guests year after year. Ease in preparation and simple ingredients ensure success to every chef...whether on land or at sea! Great changes, that have revolutionized the role of the charter yacht chef, have taken place in the charter yacht community. In the past, the majority of charter guest's desires were simple - to enjoy the beauty of the islands, relax in the comfort of their yacht and be given enough nourishment to sustain them from port to port. As the demand for more charters grew, so did the demand for more sophisticated attention to the culinary needs and requirements of charter guests. Guests are no longer content with a menu consisting of peanut butter and jelly sandwiches prepared by the first mate. Real progress has been made since the day of iron ships, wooden men, and salt pork, chased with old hardtack. Today, charter yacht chefs are well trained professionals. They possess the ability to create exciting meals for the most discriminating guests. On a daily basis, they create dining experiences equal to that of the world's finest restaurants. Each dish reflects a zest for providing dining elegance with a minimum of effort. From elegant appetizers to mouthwatering main dishes and luscious desserts, you'll find meal planning a snap! Ship to Shore I is a fascinating, and intriguing collection of closely guarded delicious recipes from luxury yacht galleys. Jan Robinson, as well as other Caribbean charter yacht chefs, now share their treasured recipes for elegant and easy meals you can make at home. With a galley smaller than most home kitchens, and with no conveniences nearby, the chefs create fabulous meals morning, noon, and night. In addition to the innovative recipes utilizing readily available ingredients this convenient and easy-to-read collection includes preparation and cooking times for easy meal planning, valuable hints, suggested accompaniments, and garnishes. Also personal anecdotes and fun to read stories about the chefs and their yachts. So weigh anchor and set sail on this culinary cruise. Bon appetit and bon voyage .... whether on land or at sea! I was given Ship to Shore I for Christmas, two years ago, and have been using it ever since. Easy-to-follow, no-fail recipes, along with lots of tips and hints. I have given this book to many friends and relatives. Definitely great on land, never cooked on a boat. V. Driscll, St. Louis, MO. This is one of the greatest books I've ever seen for an "everything" cookbook. Ship to Shore I is divided into many sections - Breakfasts and Breads, Luncheons, Salads and Dressings, Soups and Sauces, Appetizers and Beverages, Vegetables, Pasta and Rice, Meats, Poultry, Seafood, and Desserts. Also has interesting sections on Techniques to help you into healthy cooking, International idioms as to food and cooking utensils, and about the chefs and the fabulous yachts they cook on. A well organized cookbook containing some of the best recipes I have seen. Each page has a recipe with easy to follow directions, helpful tips, preparation and cooking times, and ingredients that were easy to find. Not only are these recipes easy, they are elegant. I have used the recipes for some of my best dinner parties, and received rave reviews. Probably my all-time favorite cookbook! I've made many tasty recipes from here! Great taste, and easy to prepare. 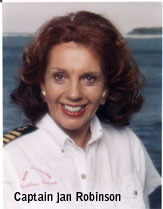 Jan Robinson has obviously collected recipes from the best yacht chefs. They show anyone how to prepare delicious dishes with few ingredients and quick preparation. The time saving recipes the cookbook offers will be appreciated by both land and seafaring cooks. The recipes range from breakfasts to desserts, and every meal in between. Mix ham, parsley, green pepper, eggs, cheese, onions and lemon juice. Cook broccoli and cut into 1-inch pieces, do not overcook. Place broccoli in buttered casserole, cover with ham mixture. Cover with cream sauce, sprinkle with 1/2 cup buttered bread crumbs. Bake for 20 minutes at 350. Cream Sauce: Melt butter, mix in flour and salt. Slowly blend milk. Stirring constantly, heat until sauce becomes thick and creamy. Heat the olive oil in a skillet. Add the garlic and shallots and cook until tender but NOT browned. Add the tomatoes, salt, pepper, thyme and basil. Simmer uncovered about 10 minutes, Add the parsley and scallops and cook, stirring occasionally, 3 to 5 minutes or until scallops are opaque. Do not overcook. Serve with rice.